"Charitees" is the name we have given to our fundraising clothing for charities and good causes. Simply by registering for a free page you can begin to raise extra funds. We provide you with a unique web link that you can use to attract visitors (via social media, your website, newsletter etc) to your range of t-shirts, hoodies, vests (all you do is provide your logo, images and we do the rest) When someone clicks on your web address they will be brought to your "Charitees" page. The page will show your causes logo, information, "Charitees VIP" sign-up (see below) and access to your branded clothing. How does your cause benefit? 1) "Charitees" products we donate 10% to your cause. 2) "Pick-A-Design" products we donate 10% to your cause. 3) "All-Over-Print" products we donate 10% to your cause. 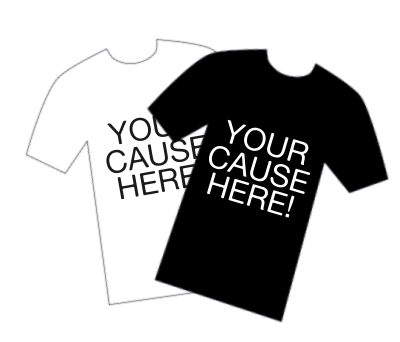 4) "Custom/Personalised" products we donate 10% to your cause! Payment frequency of funds is arranged with you at the time you register with us. You will be able to keep track of your due funds, total funds, how many supporters you have and how many VIP's you have from your Broken Heart Tees Admin dashboard once logged in. What is a "Charitees VIP"? To enable you to raise as much money as possible we have introduced our "Charitees VIP" program. People wishing to support you further can register for a VIP web link. They can use this web link on social media to publicise your "Charitees" page. Once someone clicks on a VIP link the amount of money you can raise is increased dramatically. We also reward your VIP's to help keep them motivated! It's as simple as completing the form on the right hand side of this page. Once we receive your form a member of the team will be in touch. We look forward to helping your cause.